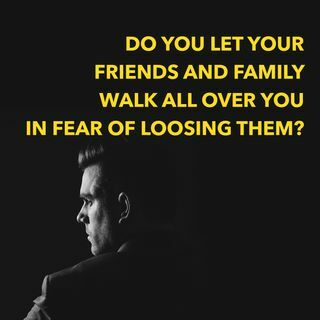 How often do you allow family and friends to get away with things they shouldn't get away with in fear of rocking the boat, and in fear of losing them? We tend to not stand up for ourself and hold in our thoughts and feelings because we don't want to vocalize how we truly feel. One reason we do this, is because we don't have personal boundaries because we want their acceptance and love. We've held our tongue time after time, waiting for true unconditional love, our ... See More co-dependent nature, and our fear of them walking out of our life keeps us quiet and secretly resentful and angry. Get the psychological information you need to create healthy boundaries, to say how you feel in a proper way, and to stop worrying about them leaving and instead change the situation or you be the one moving on.